Did someone say Peanut Butter Collard Greens? This isn’t a pairing that we are accustomed to but once you try it you will come back for more and more. What about hand squeezed Strawberry Mint Lemonade? These are only a few examples of how Zweli’s in Durham will introduce you to unique flavors and dishes made from the heart, as they focus on serving food in its most natural form. So, how does a Zimbabwean restaurant end up in the Durham? Zwelibanzi; Zweli for short, and her husband Leonardo met at Durham’s own NCCU. Years later, they decided to risk everything by opening the only authentic Zimbabwe restaurant in the country. With that, they wanted to create a warm and inviting space perfect for an intimate date night or large family gathering. They opened the doors with little to no advertising and the hope that the community would embrace their concept. The community has spoken. Zweli’s is truly a local hidden gem in a chain restaurant dominated area of Durham off 15-501. The space is packed with a diverse group that includes families and couples alike. A testament that great food has no borders. Leo greets each and every table as they eat, and not in that cheesy manager “How’s the food?” way. He’s grateful that you chose their restaurant to eat at tonight and wants to say thank you. Beyond that, the service is warm and eager to assist you with the menu. The carefully selected menu with traditional Zimbabwe fare has something for everyone. 6 hour slow cooked Ox simply falls off the bone in a hearty base. Our 2 year old even loved the aforementioned Peanut Butter Collard Greens. Flame-Grillled Piri Piri Chicken & perfectly prepared chicken wings are only a few protein choices. Also, you’ll find that vegan, vegetarian, or gluten free options are a plenty. Leo says that they get asked often if they’re a vegan restaurant simply because they have so many options. We sampled the Veggie Samosas, which are stuffed pastries, and the Chickpea Burger with avocado. These are only a few examples of the recipes Zweli creates. The pricing is affordable- a quarter chicken and two sides is $10.99; the oxtail special is $10.99 and $14.99 with 2 sides and it’s worth every. single. penny. The menu is inspired by the foods Zweli enjoyed in her village as a child growing up in Zimbabwe. One of the wonderful things about the space are the large community tables. Meant to encourage a sense of community, they are an attempt to bring people together around wonderful food! 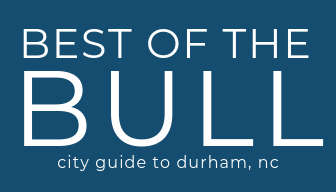 With something for everyone this restaurant is definitely a Best of the Bull favorite! Our only advice is come to Zweli’s with an open mind and you’re guaranteed to leave with a full stomach and a even fuller heart. Good news! You can also use your Shop Durham card at Zweli’s to get a Free Veggie Samosa with the purchase of any entree! Connect with Zweli’s on their website, Instagram, and Facebook.